All KIND Healthy Snacks are made from all-natural whole nuts, fruits and whole grains. No secret ingredients and absolutely nothing artificial. Just a delicious way of getting essential nutrients like fiber, protein and antioxidants. We offer a variety of KIND Nuts & Spices, Fruit & Nut, and PLUS bars in cases of six 12 bar boxes. Order today and do something KIND! 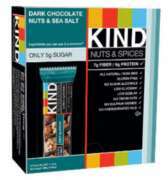 We carry KIND Nuts & Spices, Fruit & Nut, and PLUS bars in exciting flavors like dark chocolate nuts & sea salt, blueberry vanilla cashew, and peanut butter dark chocolate + protein. Buy in a case of six 12 bar boxes.